On Monday, June 11, 2018 at noon, the Monterey-Salinas Transit (MST) Board of Directors, community leaders, and staff celebrated the opening of MST’s new and expanded Monterey Bay Operations and Maintenance Facility at One Ryan Ranch Road in Monterey, California, with over a hundred guests in attendance. The updated facility expanded from its original 20,000 square feet built in 1978 for a fleet of 36 buses to a 33,000-square-foot facility designed for up to 88 buses serving the communities of the Monterey Peninsula. Pre-engineered building elements reduced both cost and construction time required for completion of the project. The ribbon was cut in front of the facility’s new service bays, after which tours were given of the new features including a new tire-servicing station, larger parts storage, water-efficient bus wash, electric bus charging station, and the second-floor communications center which offers a birds-eye view of the bus yard. Communications center employees have already moved in with operations and maintenance staff following on June 23rd. The $22 million construction project, lasting nearly 15 months, generated approximately 250 well-paying, local jobs to the area through direct and indirect activities. Project funding came from State of California Proposition 1B (2006) Public Transportation Modernization, Improvement, Service Enhancement Account Program, from the Transit and Intercity Rail Capital Program (TIRCP), and from local funds. A recent boost in TIRCP funds under Senate Bill 1, also known as ‘the gas tax’, is currently under a threat of repeal, and projects like the Monterey Bay Operations and Maintenance Facility would be stalled or cancelled across the state if the repeal effort is successful. The facility is dedicated to Thomas D. Albert (1946–1982), MST’s first general manager. Under Mr. Albert’s leadership and guidance, public transportation was converted from rivate to public ownership. He was responsible for the steady growth and improvement of public transportation throughout Monterey County. MST staff refer to the facility as ‘TDA’ in his honor. For more information, please visit www.mst.org or call Monterey-Salinas Transit toll-free at 1-888-MST-BUS1. 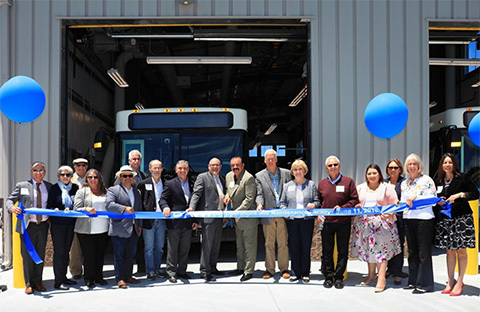 Members of the Monterey-Salinas Transit Board of Directors and staff gathered in front of MST’s new service bays to cut the ribbon on the expanded Monterey Bay Operations and Maintenance Facility.